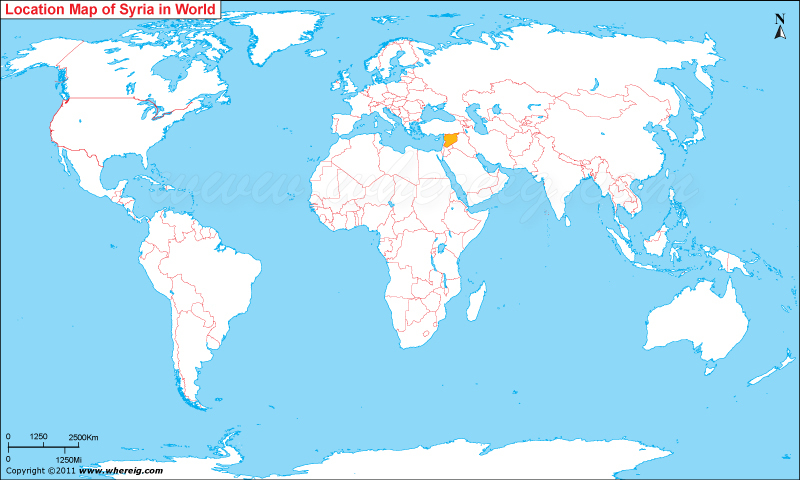 Map showing where is Syria located on the World map. The given Syria location map shows that Syria is located in the Middle East, Western Asia bordering the Mediterranean Sea, between Lebanon and Turkey. Geographic coordinates: 35 00 N, 38 00 E.
Syria map also shows that it shares its international boundaries with Turkey in the north, Lebanon and Israel in the south-west, Jordan in the south, and Iraq in the west. Besides, country has also small coastline sharing with the Mediterranean Sea. The climate type of Syria is dry and hot; winters are mild but snowfall occurs in the higher altitude regions. Interestingly, its capital city Damascus is one of the oldest continuously inhabited cities of the world. The government type of Syria is a parliamentary republic, wherein the ruling power is in the hands of the President and the ruling Ba'ath Party of Syria. The economy of the country is largely depends upon on agriculture, oil, industry, and tourism. Government Republic, under Arab Socialist Ba'ath Party regimes since March 1963.